Product code: 00034 Categories: Rings, Weddings, Wedding Rings. 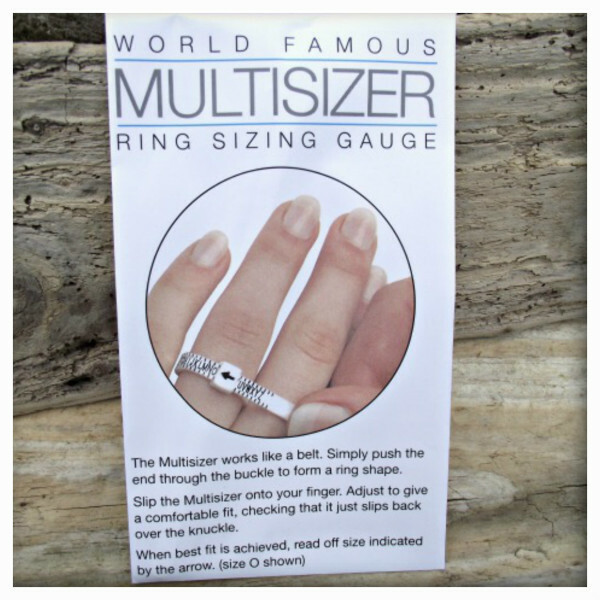 This plastic multi-size ring sizing gauge is ideal for ensuring that you order the correct size ring. The gauge is packaged in an envelope with full instructions. It works like a belt, simply form a ring and then place it over the finger and adjust to give a comfortable fit, and then read off the indicated size. This gauge is marked with British Ring Sizes A-Z. If you purchase a ring sizer to ensure that you are ordering the correct ring size, I will refund the price of the ring sizer following the purchase of a ring. Orders are sent in the UK using Royal Mail first class delivery services and a signature may be required on receipt. Postage is FREE on these orders! Items can be sent by special delivery service at an additional cost of £5 which will insure your item for loss in the post. Items are sent to overseas addresses via tracked delivery services at a cost of £8.00 per order. Please note that customers are responsible for all duties and customs charges. For dispatch times, please see individual items. One-off items are dispatched within three working days. All made to order items may take up to five weeks, to allow time for hallmarking where necessary. Your jewellery will be packaged securely, it will be sent in your choice of a cotton drawstring bag or a recycled box. There may be an additional charge for boxes depending on the product. Please note that all pieces of beachcomber jewellery are hand made, this means that there will be an organic look and feel which is unique to each piece. There may be small irregularities to the surface which is part of the hand making process and part of the charm of the piece. Due to the hand made nature, no two pieces are ever the same. I am unable to accept any returns on any personalised items, unless the goods are faulty or damaged on receipt. Due to hygiene reasons, earrings cannot be returned. If for any reason you are not happy with your purchase simply return the goods, unworn, in their original condition and packaging. Please inform me of your intention to return goods in writing by contacting me here. All goods must be returned within three weeks of delivery to receive an exchange or refund (minus the cost of postage and packaging where relevant). Postage for exchanges will be charged at £2.50, or £6.50 for special delivery. Any goods which have been specially commissioned, customised or personalised to order cannot be returned. Refunds will be made using the same method as the original payment within 30 days.